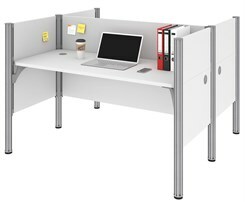 Ultra-modern stylish office cubicles at an incredible price! 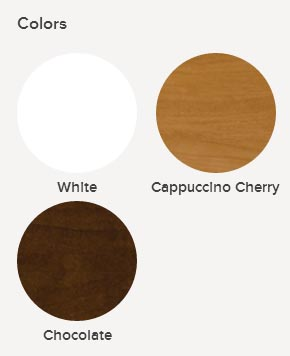 Choice of White, Chocolate or Cappuccino Cherry laminates. 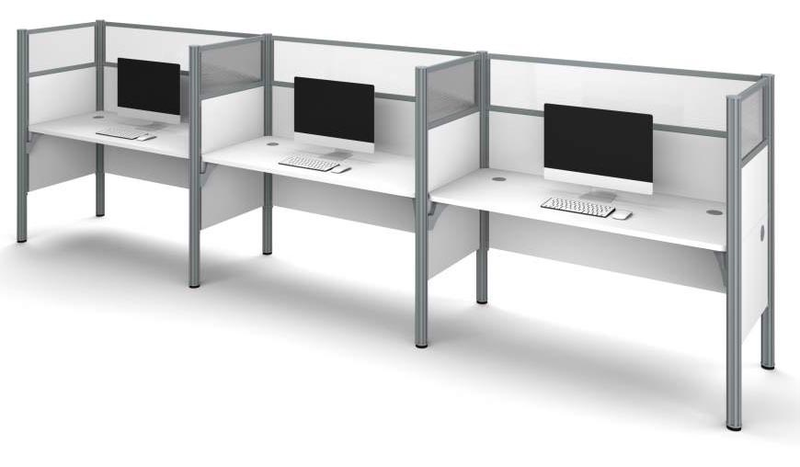 Professional grade complete cubicles prepackaged for simplicity and economically priced! 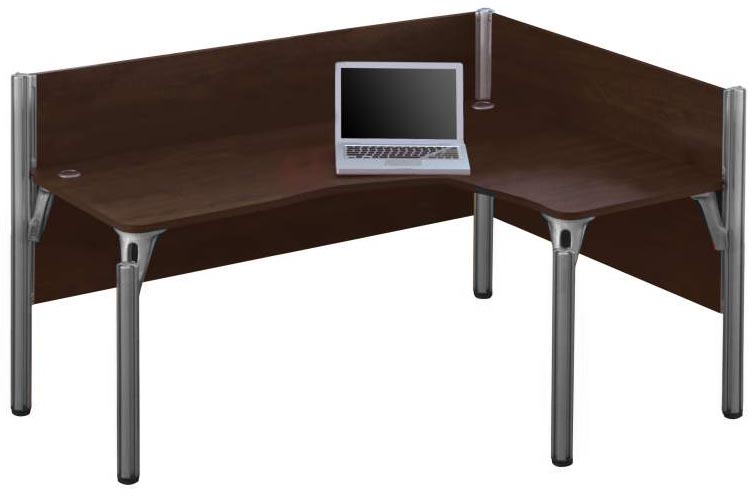 Choose from dozens of sizes and configurations to outfit your office! 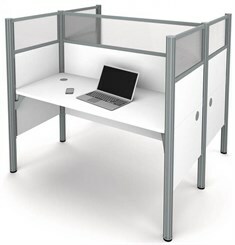 1-Person Starter Cubicle Workstation w/Windows sold above. See other configurations below. 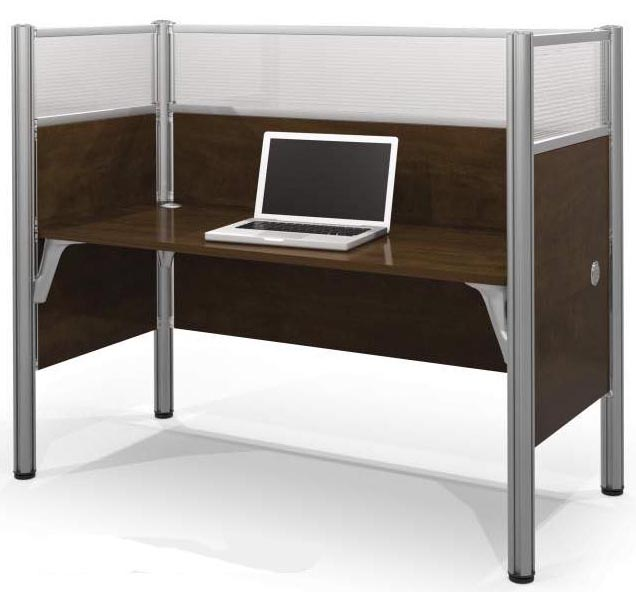 1-Person Starter Cubicle Workstation is fully enclosed on all sides. Two grommets included on desktop. 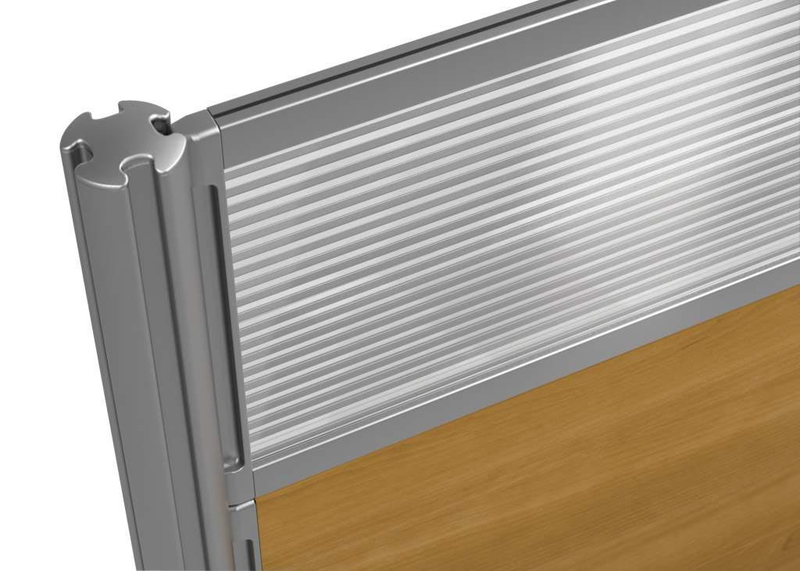 All sides feature three acrylic translucent panels. 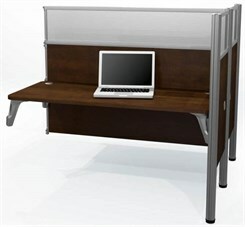 Works with optional Y10221 "Add-On" 1-Person Cubicle Workstation w/Windows to add more workstations! Measures 62-1/2"W x 29-3/8"D x 55-1/2"H overall. Ships unassembled. Shpg. wt. 369 lbs. Meets or exceed ANSI/BIFMA standards. PRICE INCLUDES SHIPPING! (Truck shipment - See Terms & Conditions). Please allow 2 weeks for delivery. 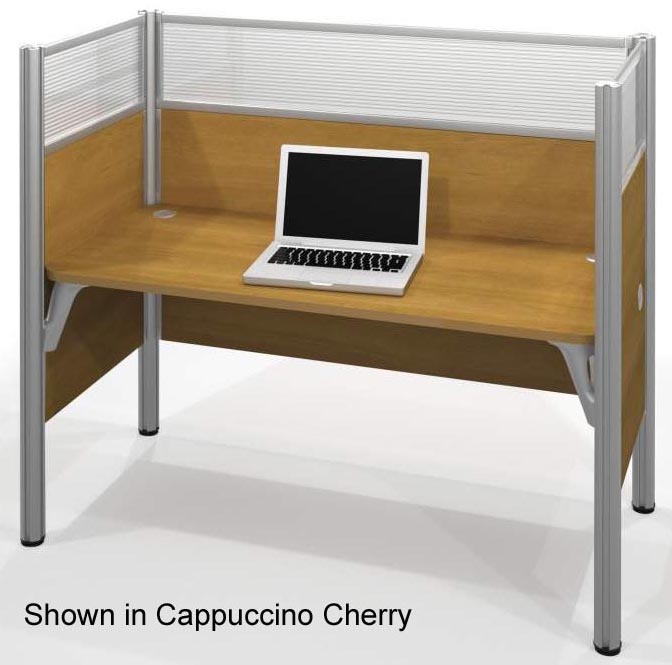 * Durable, scratch-resistant laminate construction in your choice of 3 colors: Chocolate, Cappuccino Cherry and White (White available on cluster workstations). * Spacious 26" deep worksurfaces. * Solid aluminum frame construction. * Deluxe 0.25 cm PVC edges on worksurfaces for durability. * Workstations finished on all sides. * Technology-friendly design includes grommets on worksurfaces, on side panels and on back panels for easy routing of cords and cables to wall and floor outlets. 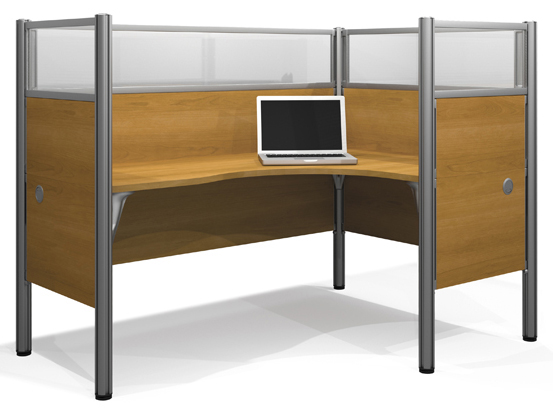 * Choose from a variety of configurations plus partition heights with or without acrylic glass. * Easy to install with no training - see red text below for assembly video. * Four-way I-Beam aluminum posts with slide lock assembly. * Meets or exceed ANSI/BIFMA standards. 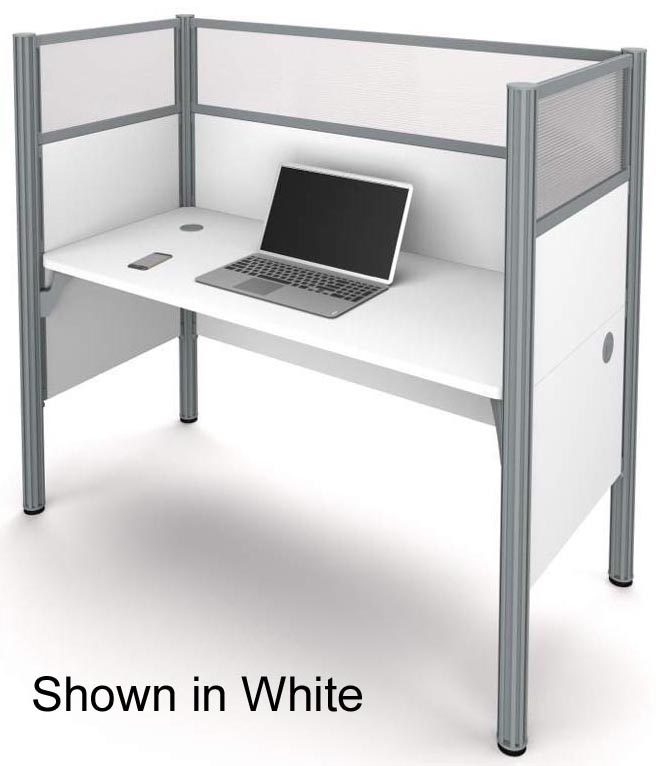 Connect this workstation onto Y10229 1-Person Starter Cubicle Workstation w/ Acrylic Window or onto other Add-On workstations. 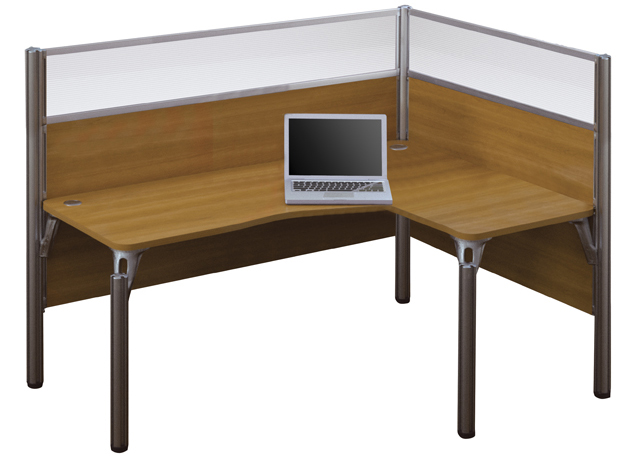 Includes two translucent acrylic panels and two grommets on worksurface. Measures 60-3/4"W x 29-3/8"D x 55-1/2"H overall. Shpg. wt. 219 lbs. Ships unassembled. PRICE INCLUDES SHIPPING! (Truck shipment - See Terms & Conditions). Like Y10229 sold above but without the translucent acrylic windows. 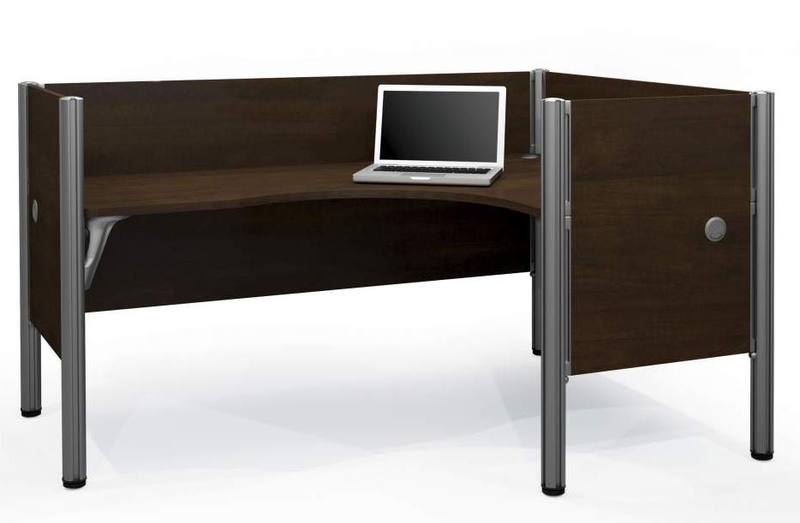 Shorter partitions conducive for open office benching applications. Includes two grommets on worksurface. Measures 62-1/2"W x 29-3/8"D x 43"H overall. Shpg. wt. 343 lbs. Ships unassembled. PRICE INCLUDES SHIPPING! (Truck shipment - See Terms & Conditions). 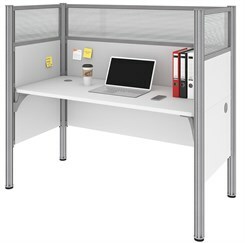 Connect this workstation onto Y10228 1-Person Starter Cubicle Workstation or onto other Add-On workstations. Includes two grommets on worksurface. Measures 60-3/4"W x 29-3/8"D x 43"H overall. Shpg. wt. 215 lbs. Ships unassembled. PRICE INCLUDES SHIPPING! (Truck shipment - See Terms & Conditions). 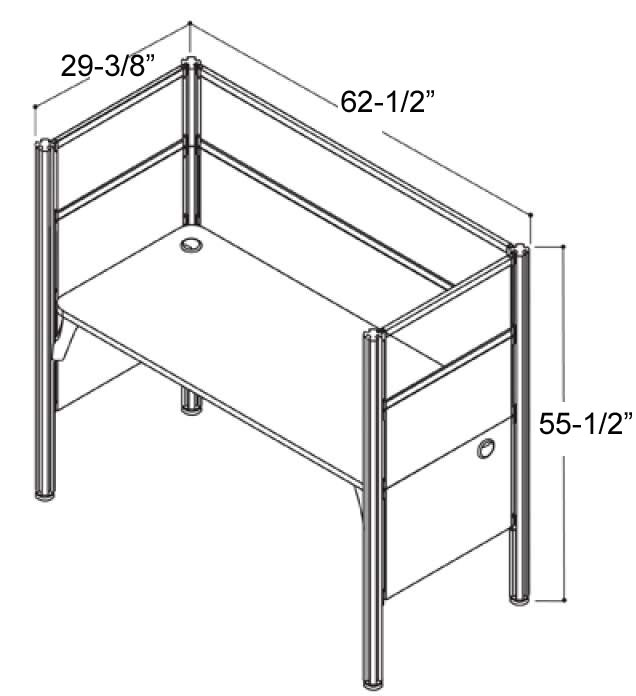 Spacious 72" x 49" worksurface includes 3 grommets. Two translucent acrylic windows. Measures 74-1/2"W x 51-3/8"D x 55-1/2"H overall. Shpg. wt. 424 lbs. Ships unassembled. PRICE INCLUDES SHIPPING! (Truck shipment - See Terms & Conditions). 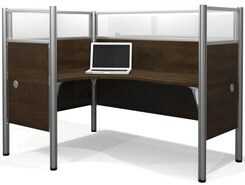 Just like L-workstations above but without the translucent acrylic windows. 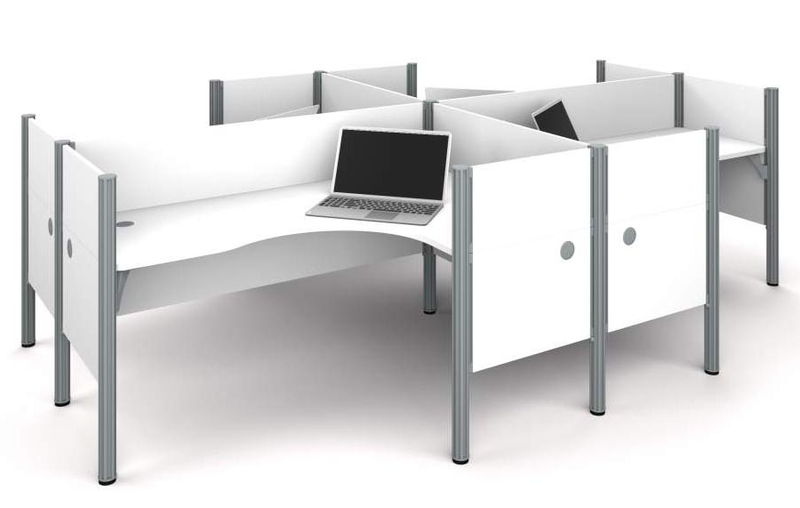 Shorter partitions conducive for open office benching applications. Worksurface includes three grommets. Measures 74-1/2"W x 51-3/8"D x 43"H overall. Shpg. wt. 418 lbs. Ships unassembled. PRICE INCLUDES SHIPPING! (Truck shipment - See Terms & Conditions). Mirror image of L-workstation above. Shorter partitions conducive for open office benching applications. Worksurface includes three grommets. Measures 74-1/2"W x 51-3/8"D x 43"H overall. Shpg. wt. 418 lbs. Ships unassembled. PRICE INCLUDES SHIPPING! (Truck shipment - See Terms & Conditions). Includes end panels on both sides of desks for added privacy. 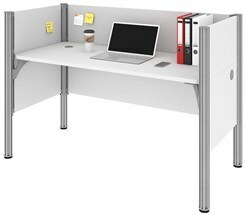 Spacious 72" x 49" worksurface includes 3 grommets. Four translucent acrylic windows. Available in Cappuccino Cherry or Chocolate. Measures 74-1/2"W x 51-3/8"D x 55-1/2"H overall. Shpg. wt. 499 lbs. Ships unassembled. PRICE INCLUDES SHIPPING! (Truck shipment - See Terms & Conditions). 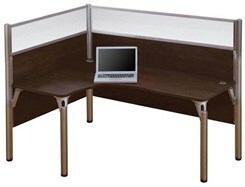 Mirror image of L-workstation above. 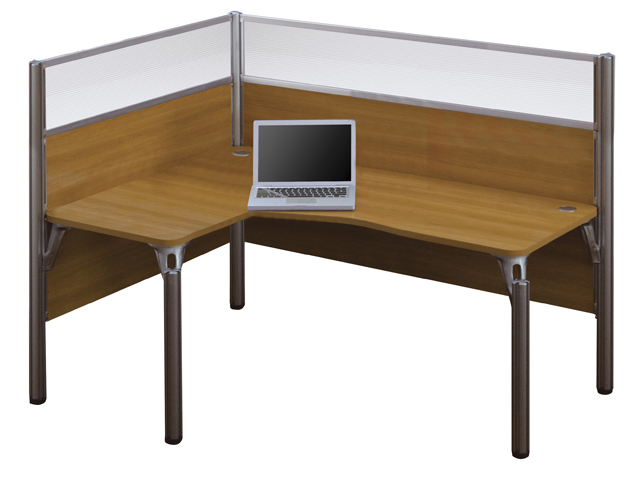 Includes end panels on both sides of desks for added privacy. 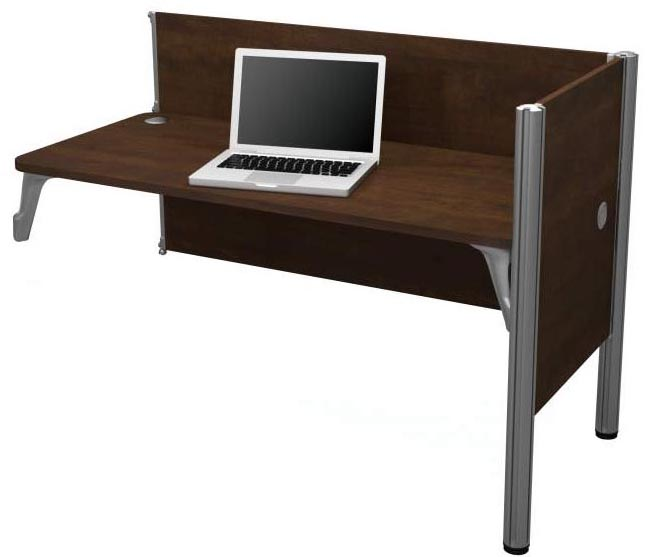 Spacious 72" x 49" worksurface includes 3 grommets. Four translucent acrylic windows. Measures 74-1/2"W x 51-3/8"D x 55-1/2"H overall. Shpg. wt. 499 lbs. Ships unassembled. PRICE INCLUDES SHIPPING! (Truck shipment - See Terms & Conditions). 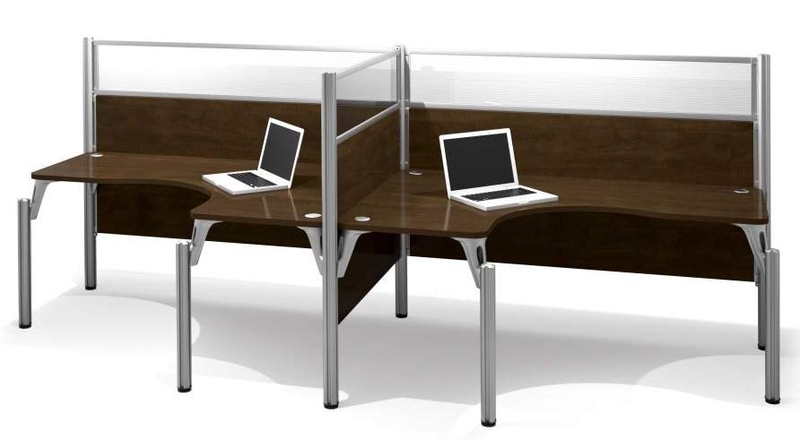 Just like L-workstations above but without the translucent acrylic windows. 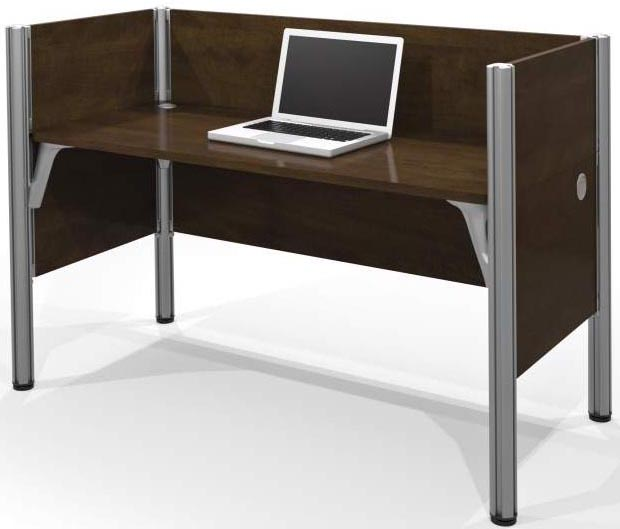 Includes end panels on both sides of desks for added privacy. 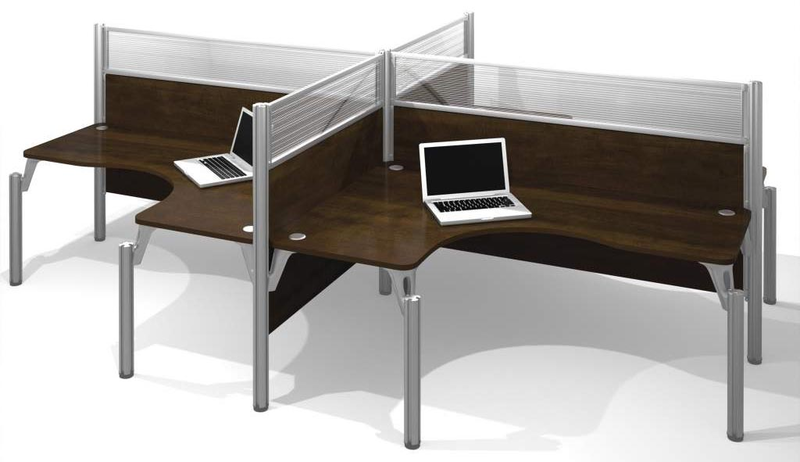 Shorter partitions conducive for open office benching applications. Worksurface includes three grommets. Measures 74-1/2"W x 51-3/8"D x 43"H overall. Shpg. wt. 458 lbs. Ships unassembled. PRICE INCLUDES SHIPPING! (Truck shipment - See Terms & Conditions). 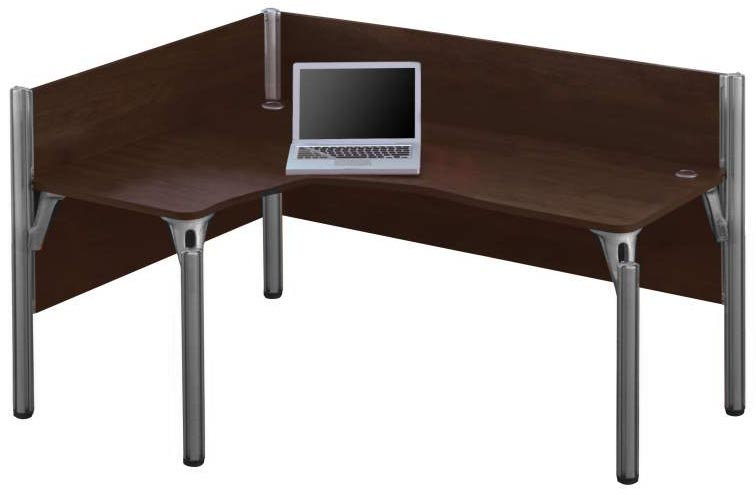 Mirror image of workstation above. 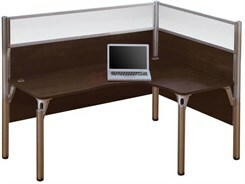 Includes end panels on both sides of desks for added privacy. Shorter partitions conducive for open office benching applications. Worksurface includes three grommets. Measures 74-1/2"W x 51-3/8"D x 43"H overall. Shpg. wt. 458 lbs. Ships unassembled. PRICE INCLUDES SHIPPING! (Truck shipment - See Terms & Conditions). Five acrylic glass panels. Meets or exceed ANSI/BIFMA standards. Measures 62-1/2"W x 56-1/10"D x 55-1/2"H overall. Shpg. wt. 479 lbs. PRICE INCLUDES FREIGHT! (Truck shipment - See Terms & Conditions). Three acrylic glass panels. Meets or exceed ANSI/BIFMA standards. Measures 60-4/5"W x 56-1/10"D x 55-1/2"H overall. Shpg. wt. 294 lbs. PRICE INCLUDES FREIGHT! (Truck shipment - See Terms & Conditions). Meets or exceed ANSI/BIFMA standards. Measures 62-1/2"W x 56-1/10"D x 43"H overall. Shpg. wt. 439 lbs. PRICE INCLUDES FREIGHT! (Truck shipment - See Terms & Conditions). Meets or exceed ANSI/BIFMA standards. Measures 60-4/5"W x 56-1/10"D x 43"H overall. Shpg. wt. 288 lbs. PRICE INCLUDES FREIGHT! (Truck shipment - See Terms & Conditions). 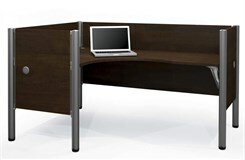 Includes two L-shaped workstations. Four acrylic glass panels. Meets or exceed ANSI/BIFMA standards. Measures 146"W x 51-2/5"D x 55-1/2"H overall. Shpg. wt. 613 lbs. PRICE INCLUDES FREIGHT! (Truck shipment - See Terms & Conditions). 1 - 2 $1,899.00 ea. 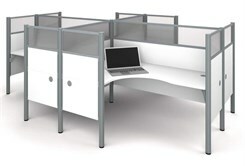 Includes two L-shaped workstations. Meets or exceed ANSI/BIFMA standards. Measures 146"W x 51-2/5"D x 43"H overall. Shpg. wt. 603 lbs. PRICE INCLUDES FREIGHT! (Truck shipment - See Terms & Conditions). Includes two L-shaped workstations. Seven acrylic glass panels. Meets or exceed ANSI/BIFMA standards. Measures 146"W x 51-2/5"D x 55-1/2"H overall. Shpg. wt. 642 lbs. PRICE INCLUDES FREIGHT! (Truck shipment - See Terms & Conditions). 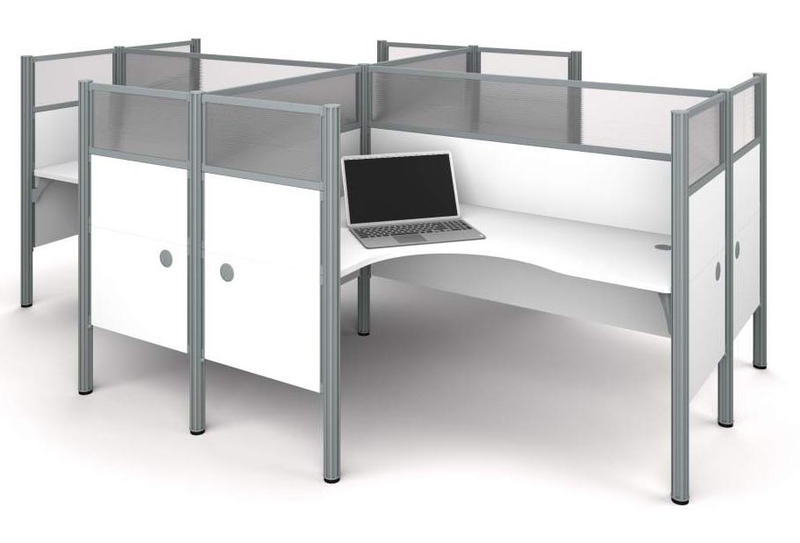 Includes two L-shaped workstations. Meets or exceed ANSI/BIFMA standards. Measures 146"W x 51-2/5"D x 43"H overall. Shpg. wt. 663 lbs. PRICE INCLUDES FREIGHT! (Truck shipment - See Terms & Conditions). 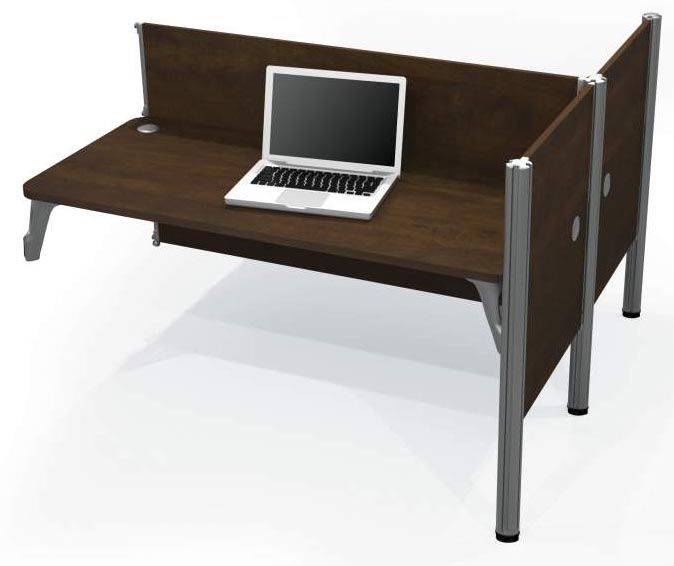 Includes two L-shaped workstations. Three acrylic glass panels. Meets or exceed ANSI/BIFMA standards. Measures 146"W x 51-2/5"D x 55-1/2"H overall. Shpg. wt. 579 lbs. PRICE INCLUDES FREIGHT! (Truck shipment - See Terms & Conditions). 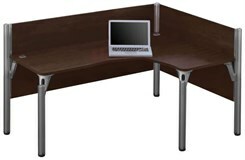 Includes two L-shaped workstations. Meets or exceed ANSI/BIFMA standards. Measures 72"W x 48"D x 12"H overall. Shpg. wt. 571 lbs. PRICE INCLUDES FREIGHT! (Truck shipment - See Terms & Conditions). 1 - 2 $2,699.00 ea. 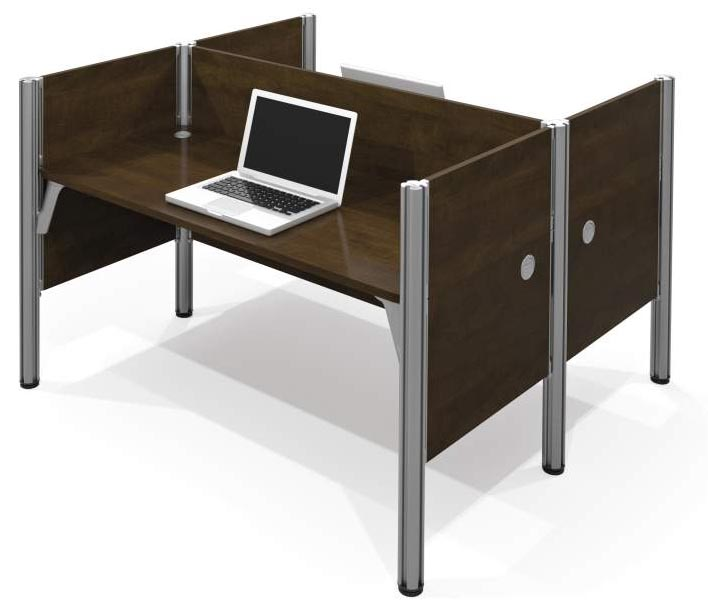 Includes two L-shaped workstations. Seven acrylic glass panels. Meets or exceed ANSI/BIFMA standards. Measures 146"W x 51-2/5"D x 55-1/2"H overall. Shpg. wt. 719 lbs. PRICE INCLUDES FREIGHT! (Truck shipment - See Terms & Conditions). Includes two L-shaped workstations. Meets or exceed ANSI/BIFMA standards. Measures 146"W x 51-2/5"D x 43"H overall. Shpg. wt. 651 lbs. PRICE INCLUDES FREIGHT! (Truck shipment - See Terms & Conditions). 1 - 2 $2,899.00 ea. Seven acrylic glass panels. Meets or exceed ANSI/BIFMA standards. Measures 182-3/10"W x 29-2/5"D x 55-1/2"H overall. Shpg. wt. 708 lbs. PRICE INCLUDES FREIGHT! (Truck shipment - See Terms & Conditions). Meets or exceed ANSI/BIFMA standards. Measures 182-3/10"W x 29-2/5"D x 43"H overall. Shpg. wt. 648 lbs. PRICE INCLUDES FREIGHT! (Truck shipment - See Terms & Conditions). 1 - 2 $3,399.00 ea. 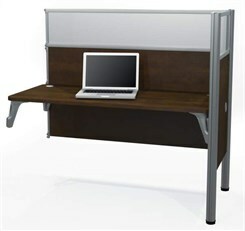 Includes four L-shaped workstations. Four acrylic glass panels. Meets or exceed ANSI/BIFMA standards. Measures 146"W x 100-1/10"D x 55-1/2"H overall. Shpg. wt. 822 lbs. PRICE INCLUDES FREIGHT! (Truck shipment - See Terms & Conditions). 1 - 2 $2,999.00 ea. Includes four L-shaped workstations. Meets or exceed ANSI/BIFMA standards. Measures 146"W x 100-1/10"D x 43"H overall. Shpg. wt. 812 lbs. PRICE INCLUDES FREIGHT! (Truck shipment - See Terms & Conditions). 1 - 2 $4,399.00 ea. 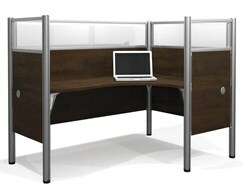 4-Person workstation features L-shaped worksurfaces and four acrylic glass windowed panels that are 55-1/2"H for privacy. 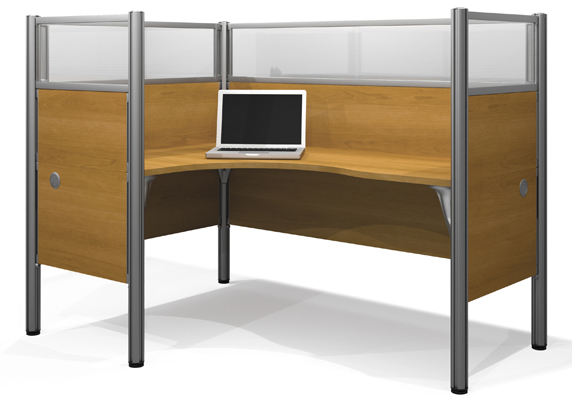 End panels on each desk offer more privacy. 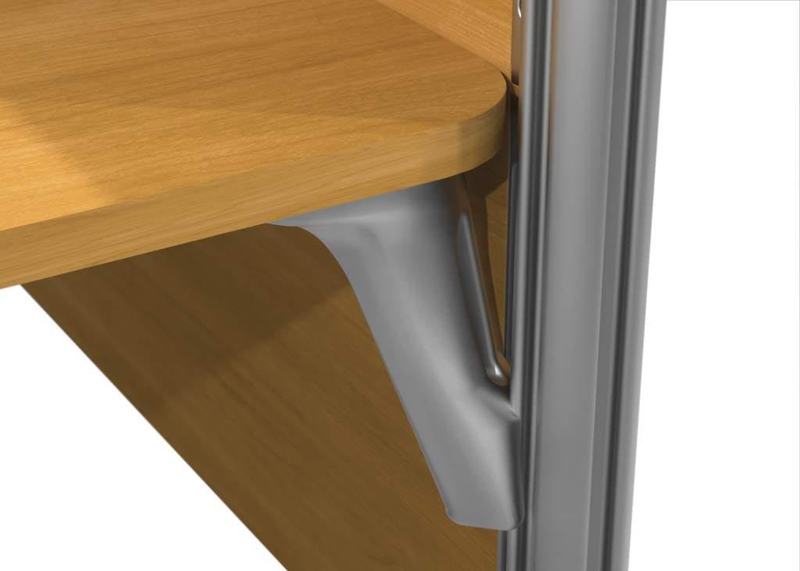 Each desktop includes three grommets for wire management. Measures 146"W x 100-1/8"D x 55-1/2"H overall. Ships unassembled. Shpg. wt. 998 lbs. PRICE INCLUDES SHIPPING! (Truck shipment - See Terms & Conditions). 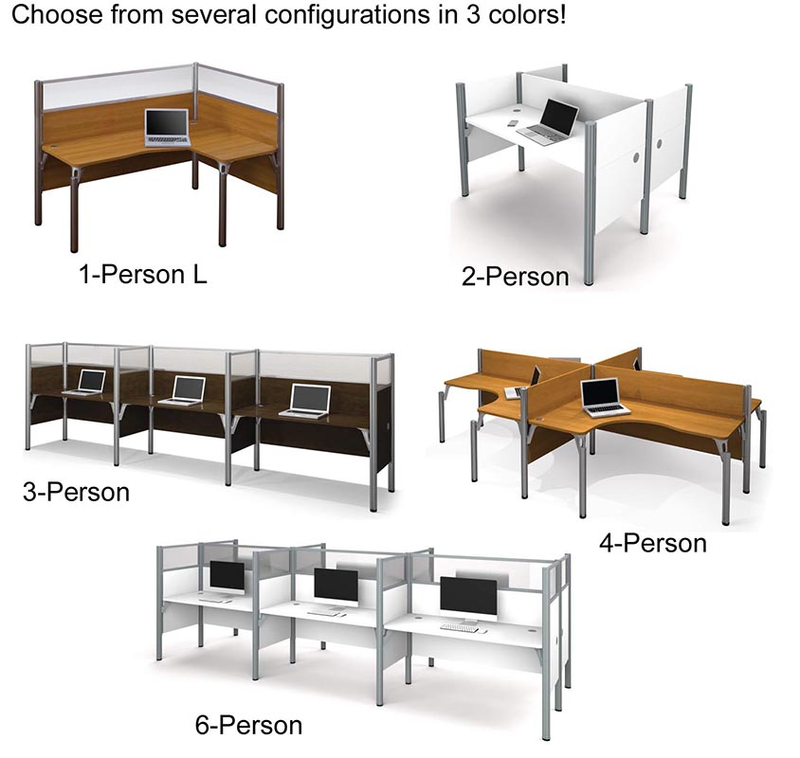 Includes four L-shaped workstations. Meets or exceed ANSI/BIFMA standards. Measures 146"W x 100-1/10"D x 43"H overall. Shpg. wt. 972 lbs. PRICE INCLUDES FREIGHT! (Truck shipment - See Terms & Conditions). 1 - 2 $4,499.00 ea. Eleven acrylic glass panels. Meets or exceed ANSI/BIFMA standards. Measures 182-3/10"W x 56-1/10"D x 55-1/2"H overall. Shpg. wt. 914 lbs. PRICE INCLUDES FREIGHT! (Truck shipment - See Terms & Conditions). Meets or exceed ANSI/BIFMA standards. Measures 182-3/10"W x 56-1/10"D x 43"H overall. Shpg. wt. 790 lbs. PRICE INCLUDES FREIGHT! (Truck shipment - See Terms & Conditions). Keyboard Shelf on ball-bearing slides. Must be attached to the credenza. Measures 26-2/5"W x 14-3/5"D x 2-4/5"H overall. Shpg. wt. 17 lbs. PRICE INCLUDES FREIGHT! (Truck shipment - See Terms & Conditions).